The Cassini spacecraft looks down, almost directly at the north pole of Dione. The feature just left of the terminator at bottom is Janiculum Dorsa, a long, roughly north-south trending ridge. Image taken March 22, 2008. The plain-looking Saturn moon Dione may have once had a geologically active subsurface ocean, new images from NASA's Cassini spacecraft reveal. Images of Dione's 500-mile-long (800 kilometers) mountain Janiculum Dorsa suggest that the moon could have been a weaker copycat of Enceladus, Saturn's icy geyser moon. "There may turn out to be many more active worlds with water out there than we previously thought," Bonnie Buratti, who leads the Cassini science team at NASA's Jet Propulsion Laboratory in Pasadena, Calif., said in a statement. Subsurface oceans are thought to exist on several bodies in the solar system, including Saturn's moons Enceladus and Titan and Jupiter's moon Europa. These geologic hotspots have garnered the interest of scientists searching for the building blocks of life beyond Earth. If Dione turned out to have a liquid layer under its crust, that would increase the moon's chances of supporting life. Cassini, which has been exploring Saturn since 2004, detected a weak particle stream coming from Dione with its magnetometer. Images taken by the spacecraft suggest a slushy liquid layer might exist beneath its icy crust, as well as ancient, inactive fractures that now spew water ice and carbon-containing particles, much like ones seen on Enceladus. Dione's Janiculum Dorsa ranges from about 0.6 to 1.2 miles (1 to 2 kilometers) in height. The mountain seems to have deformed the icy crust underneath by as much as 0.3 mile (0.5 kilometer). The deformation implies the crust was warm, most likely from a subsurface ocean when the mountain formed, the researchers said. As Dione swings around Saturn, it gets squished and stretched, causing it to heat up. When you have a subsurface ocean that lets the icy crust float around on top, Saturn's gravitational pull becomes amplified and generates 10 times more heat, the researchers said. The heating could also be caused by a local hotspot or a crazy orbit, but these explanations are less likely. 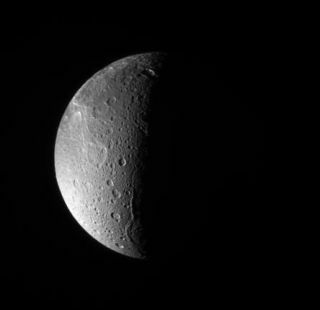 Scientists don't know why Dione hasn't been as active as Enceladus. The latter may have experienced stronger gravitational forces or more radioactive heating in its core, they suggest. Subsurface oceans appear to be common on icy satellites, and could exist on dwarf planets like Ceres and Pluto. Cassini's recent findings were reported in March in the journal Icarus. Follow Tanya Lewis on Twitter and Google+. Follow us @Spacedotcom. We're also on Facebook & Google+. Original article on SPACE.com.